Hello and welcome to the Ketamine Healing Clinic of Los Angeles. My name is Dr. David Mahjoubi, MD, and I’m a Board-Certified Anesthesiologist. I have 12 years of experience with intravenous Ketamine dating back to my training in 2006 at the University of Southern California. Following my residency, I joined the Anesthesia Group at Northridge Hospital Medical Center, where I was the most active user of IV Ketamine for both conscious sedation and general anesthesia cases. I went on to work at surgical centers throughout Southern California and noted beneficial mental health effects in many of my patients post-procedurally. Researching the literature regarding IV Ketamine and its benefits for people with Major Depression & Chronic Pain, I learned of its ability to really help those who have been resistant to other treatments for depression. 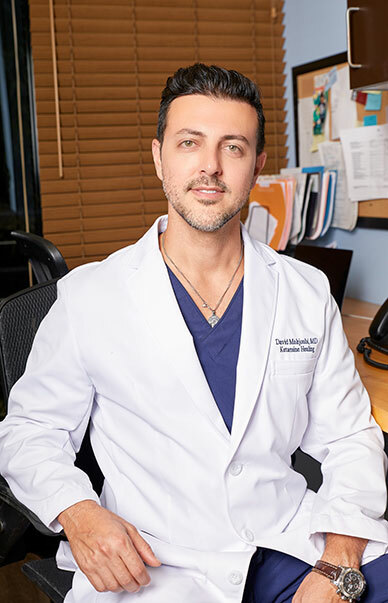 Dr. David Mahjoubi, MD is a Diplomate of the American Board of Anesthesiology. He earned his Doctor of Medicine at The Chicago Medical School and completed his residencies at the UCLA Ronald Reagan Medical Center and USC / L.A. County Medical Center. He is currently on staff at Marina Del Rey Hospital and its’ affiliate Cedars-Sinai Medical Center, as well as Mission Community Hospital. Dr. Mahjoubi carries over a decade of experience with intravenous Ketamine, and is the author of multiple publications in the medical field. He holds a flawless record with the Medical Board of California and American Board of Anesthesiology. Yashar P, Sepahdari A, Mahjoubi FD. Primary Squamous Cell Carcinoma of the Breast in an Adult Woman. The Breast Journal. 12(6) 571-72, 2006. Co-Author, Preoperative Clinic Rotation Manual. University of Southern California Department of Anesthesiology, 2006. Reliability of Transthoracic Echocardiography versus CT Angiography in Cardiac Thrombus with Pulmonary Embolism in the ICU. Western Anesthesia Regional Conference, Virginia Mason Medical Center, Seattle, 2008. Case Report Poster Presentation, Primary Author. Postoperative Adrenal Failure Following Retroperitoneal Lymph Node Dissection Surgery. Western Anesthesia Regional Conference, Rancho Mirage, CA, 2009. Case Report Poster Presentation, Second Author. The Medical and Fiscal Consequences of the Lack of Motorcycle Helmet Laws in Illinois. Illinois Academy of Family Physicians, Medical Education Community Orientation Program, 2002. Primary Author.